The countermark on the following coin is from the Îles Glorieuses in the Indic Ocean (NW of Madagascar). Host coin is 5 Francs of France. "C" standing for Coconut(s) or Copra. This one is also not in my collection and unknown to any catalogue. All kind of comments appreciated! The C possibly stands for Hippolyte Caltaux who was the first settler on the islands and had a coconut plantation. But perhaps issued before it became a possession of France. These little islands are rather magnificent. 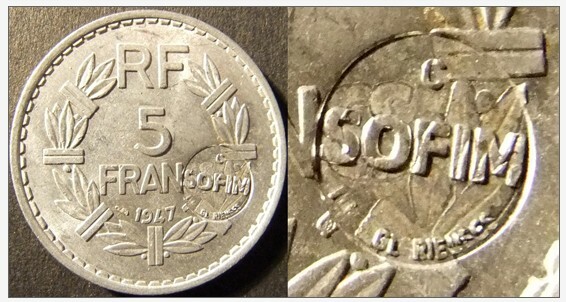 SOFIM worked there until 1958, the youngest host coin is from 1953 (for Juan de Nova from 1955). So we have a very small possible span for these tokens. I think Hippolyte Caltaux (born 1847) has ceded earlier. The "C" standing for coconuts or copra makes sense comparing it with the P (phosphate) from Juan de Nova. The nominals for this token coinage are 50 ct, 1 Fr, 2 Fr, 5 Fr, 10 Fr and 20 Fr. The tokens probably had this worth, too, as all countermarks were made beside the denomination, except the pieces of 50 ct, which were too small to do so. The worker's life conditions ( corporal punishments, emprisonment, etc..) were such that an official investigation was launched by the french authorities, then triggering the dissolution of the company in 1968. During the period, all the products had to be bought from the company store on the island : We can imagine that the countermarking was a way to "freeze" the money of the workers. As said above by Afrasi, the P means probably " Phosphats " and the C " Coprah "
Would it be possible to get pictures ( obverse & reverse, of course ) of the two coins which have been signaled ? Did you hear only about these two coins or are there other ones ? I am trying to find a way to go further, but it is not really easy ...! I am wondering if these countermarks could have been done with a sealing tool ; phosphats and coprah were put in large bags which could have been sealed ( generally with lead ). The pictures could be interesting to better understand. I have located an article in World coins on all the Juan de Nova Island pieces; here is one of the images displayed as no doubt the page will disappear soon. Madagascar, French and French colonial coins were so counter-marked. Hilmar J. Herzberg numismatist living in Madagascar, just reported these nice countermarked tokens, as having circulated in Juan de Nova Island in the 1950s. These tokens were countermarked probably in the mid-1950s from the SOFIM (Societe Francaise des Iles Malgaches) operating phosphate (guano) mines on the island from 1900 to 1968, when all economic activities ended. 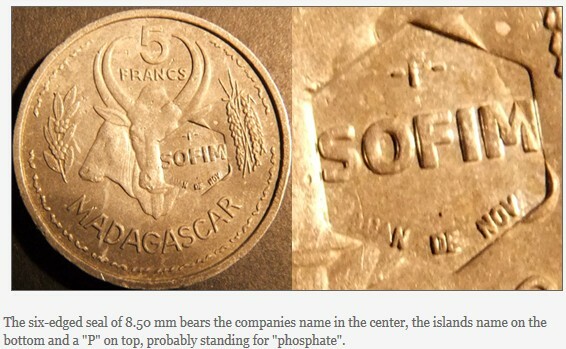 The six-edged seal of 8.50 mm bears the companies name in the center, the islands name on the bottom and a "P" on top, probably standing for "phosphate". The number of tokens issued must have been rather limited, because only a few workers from Seychelles, Mauritius and Comoros were employed to mine the guano found on this flat island. Further research is under way. Hilmar J. Herzberg numismatist living in Madagascar, just reported these nice countermarked tokens, as having circulated in Glorioso Islands in the 1950s. These tokens were countermarked probably in the mid-1950s from the SOFIM (Societe Francaise des Iles Malgaches) operating coconut plantations on the islands from 1907-1958, when all economic activities ended. The round seal of 8.50 mm bears the company name in the center, the islands name on the bottom and a "C" on top, probably standing for "coco" or "copra". That article is dated October 2012. Odd, that nothing was heard of these for 60 years and suddenly a few turn up at the same time. Maybe the "further research" turns up a reason. The information on that other page is evidently from the same source as Afrasi's information - not a separate discovery. Can smbdy provide a picture of the reverse ? Patience, maxmissy. The only one who has one is afrasi and he is travelling. Having seen the last ones, I do not think anymore that the prints have been made with a sealing tool, but with a "classic " stamp. I think that a lot of token collectors ( me too ) will now search to get some ones. I have bought several of these, some are still winging their way to me from Germany. Getting more expensive with each new listing. Now another seller has appeared on the scene with another twenty coins for sale, this time from a seller in Austria; ten Glorioso islands and ten Juan de Nova Island.